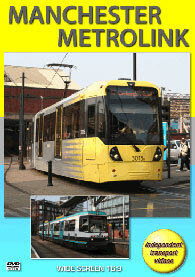 Manchester Metrolink opened in 1992 with a 19-mile route that ran from Bury to Altrincham via Manchester city centre using former railway lines inherited from British Rail. In view of this all stops were constructed to mainline railway platform height. Initially there was some 3km of street running from Victoria station to Piccadilly station, but this has now been extended as the system has developed. Major extensions to the network began in 2009 and by 2014 the trams also serve Rochdale, Oldham, Ashton-under-Lyne, East Didsbury and Eccles. The original trams for the Metrolink system were 26 Firema two-section, articulated bi-directional trams, built in Italy, known as the ‘T68’. In 1999 when the extension to Eccles was built these were augmented by a further batch of six trams built by Firema/Ansaldo of Italy looking similar to the first batch, but known as the ‘T68A’. As the system grew, further trams were needed, and an initial order for eight trams was placed with Bombardier, but with service expansion this was increased to 104 trams. These trams are known as the M5000, again a 2-section bi-directional car manufactured by Bombardier in either Bautzen, Germany or at their factory in Vienna. This programme starts with a brief look in still pictures of the original T68s in their first few months of service at Victoria. We then move to some archive video taken in 1993 through the camera of Malcolm King featuring the T68s in service in central Manchester around Piccadilly Gardens. It shows off their original livery that featured less aquamarine, as later repaints incorporated an aquamarine roofline stripe and doors. We then see some further stills taken in 2012 of the new M5000 trams alongside the T68s and T68As. The next section was filmed by our own cameras in December 2013 in and around Piccadilly Gardens where we see plenty of action that includes T68, 1012 + 1022. 1012 was withdrawn a few days after filming with 1022 running on until February 2014 when that to was withdrawn. Our cameras also visit Corporation Street, High Street, Aytoun Street and Shudehill. The main section of our programme was filmed in March 2014, where we cover some of the 2013 locations as well as Mosley Street, St Peter’s Square, Lower Mosley Street, Cornbrook, MediaCityUK and Broadway. We then travel on tram 3063 to Eccles and do further filming at Salford Quays before returning to the city centre for more action. Look out for a future release from independent transport videos which will feature yet more from this growing system. Duration : 63 minutes (approx).